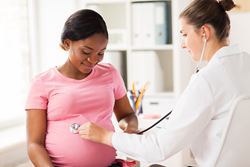 PPDE offers immediate prenatal care appointments to give patients an early start on pregnancy care. Prenatal Services are now offered at PPDE locations in Wilmington and Newark. Our program now provides the full spectrum of care from preconception through pregnancy and delivery. Planned Parenthood of Delaware (PPDE) has added prenatal care to its roster of reproductive health services. This new service will directly benefit women with insurance through Medicaid by offering more options for prenatal care and for deliveries at Christiana Care Health System. In addition, PPDE will refer patients with a high risk pregnancy to Christiana Care for prenatal care. A dedicated and credentialed team of clinicians, midwives and medical doctors. A 90-minute initial checkup that includes a review of patient health history, a physical, blood testing, ultrasound for gestational dating and identification of risk factors. Regular checkups throughout the pregnancy. Women usually learn that they are pregnant at about 4 weeks, but the first prenatal care exam may not take place until 11 to 20 weeks into the pregnancy. PPDE offers access to immediate prenatal appointments at PPDE locations in Newark and Wilmington. The addition of prenatal care to PPDE’s health care services helps patients plan a healthy pregnancy. That is especially important in Delaware, a state with one of the highest rates of infant mortality in the United States. Prenatal care can mean the difference between having a full-term baby and a baby born prematurely. Prematurity brings a host of health risks, often requires an extended stay in a neonatal intensive care unit and carries the developmental and financial costs that can come with prematurity. PPDE eventually plans to expand prenatal care services to the organization’s Dover location. Planned Parenthood of Delaware provides one-third of the reproductive health care services for low income women in the State. For over 80 years, PPDE has been dedicated to providing high quality health care to women of all ages: from birth control to pregnancy tests; abortion services, well woman care, breast screening, osteoporosis screening and treatment, menopause screening and treatment, and now prenatal care. We also provide well man care, screenings, and sexual health and reproductive services to men of all ages.